Cinnamon is commonly referred to the bark of a tree cinnamomum zeylancium and is mostly used in cooking. These trees are native to South East Asian region and have spread throughout the world from here. Cinnamon also has its mention in Bible. Cinnamon Oil can be obtained through steam distillation of bark as well as leaves and twigs of the cinnamon tree. 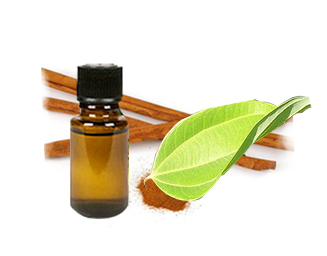 Cinnamon leaf Oil is mostly used in aromatherapy and smells like cloves. Cinnamon bark oil is more expensive then the cinnamon leaf oil. Both these oils are also used in fragrance industry. There are records which suggest that Cinnamon bark was being used by Chinese around 2700 BC. Later around 2000 BC it is known that Egyptians imported this from China and started using it. In fact the Hebrew Bible also specifically mentions Cinnamon quite few times as it signifies the usefulness of this plant. It was a highly prices commodity in ancient times and was considered to be gifted to Kings and even offered to God. Asian Cinnamon found its way to Arab Africa from where the traders took it to various European markets. Today Cinnamon is commercially cultivated in Sri Lanka, India, Bangladesh, Indonesia, West Indies, Madagascar and Zanzibar. The major chemical Constituent of Cinnamon essential Oil obtained through the bark of the cinnamon tree is cinnameldehyde while cinnamon oil from the leaves comprises of eugenol. Cinnamon leaf oil is considered to be relatively less toxic then the bark oil. Cinnamon oil is also rich in minerals; iron, calcium and manganese. Tonic from Brain: Cinnamon is known to stimulate and boost the activity of brain hence giving relief from nervous tension and memory loss. Purifies Blood: The unique properties of cinnamon help to clean the impurities of blood and subsequently reduces and removes pimples. Improved Blood Circulation: Cinnamon Oil has a unique blood thinning compound which reduces the viscosity of blood making it easy to circulate. Stops bleeding: This essential Oil when applied on wounds stops bleeding and helps the wounds to heal faster. Indigestion: Cinnamon not only adds flavours and aroma to food it also helps the food to get digested effectively. Other therapeutic properties of Cinnamon oil: Relief from respiratory problems, relief from menstrual discomfort, increases secretion of milk, mouth freshener, diuretic etc. Packing: packed in drums of 180 kgs/drum (N.W), 196.5 kgs/drum (G.W). 80 drums (14.40 MTS) in 20ft FCL. Could you please send me an offer for Cassia Bark Essential Oil for 180 kg, 900 kg, and ~ 10 mt (FOB prices)?